Who doesn’t love a solid chicken dish? 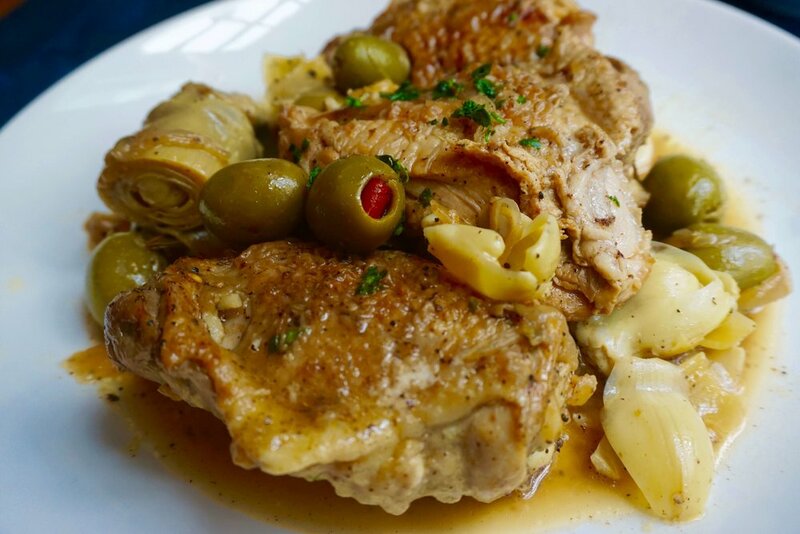 This baked olive, artichoke and lemon chicken is layered with flavor. Browned and braised with briny olives and spices. I completed this meal with a quick but flavorful side of white wine sautéed mushrooms over rice. This is what happens when I improvise! Having staples in your pantry that are ready to go allow you to make masterpieces on the fly is crucial. Which is why I’m happy to continue to spread the word with Cans Get You Cooking. You will always find cans of chicken stock, and tomatoes in my pantry. I also love to keep olives on hand for sauces and salads. The artichokes and mushrooms are great to marinate or add to a side dish. What are some of your pantry staples? Preheat the oven to 425 degrees. Pat the chicken dry and season salt, pepper, onion, and garlic powder. Heat the olive oil in a dutch oven over medium-high heat. Add the chicken, working in batches if necessary, and cook until well browned on each side, about 5 minutes per side. Transfer to a plate. Decrease the heat to medium. Add the onion and a pinch of salt and sauté until soft and slightly golden, about 5 minutes. Add the garlic and sauté for 1 minute. Season with 1 tsp salt, ½ tsp pepper, cumin and stir. Add the white wine to the pot to deglaze, scraping up any of the brown bits. Let the wine simmer and reduce to about half. Place the lid on the pot and put it in the oven for 20-25 minutes, until the chicken is cooked through. After 20-25 minutes remove the pot from the oven. Add the lemon zest, olive juice, red pepper flakes, and stir gently. Uncover, place back in the oven for 8-10 minutes longer. Remove from the oven and serve chicken with sauce, artichoke pieces and olives spooned over.